The What: Utelogy Corporation will release several enterprise management features in June of this year. 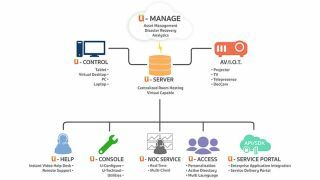 The How: Utelogy is software-defined AV, a software-only platform for controlling, monitoring and maintaining technology environments. Software-defined Audio Visual (SDAV) is the practice of leveraging software to connect a manufacturer-agnostic network of audio-visual devices, such as projectors, monitors, speakers, and cameras via the cloud. This fundamental change in the delivery of AV systems creates an enterprise "system of systems" that can be integrated with various other enterprise systems under IT management. The New: While the platform has been in service for some time across higher education, corporate and government, Utelogy 2.0 and its enhancements mark a coming of age as "it liberates the enterprise," the company stated. Utelogy’s U-Server software is built on a standard’s based .net framework and deployed utilizing IT infrastructure and skill sets combined with AV best practices to deliver a platform for conference rooms, classrooms and anywhere you deploy technology. One of the enhancements in 2.0 comes in the U-Control module. It includes the delivery of a 100% customizable GUI built in Java and HTML5. With Utelogy's user-interface, you can control any room from any device any way you choose, Android, iOS, PCs and Macs, as well as traditional touch interfaces. Changes can be made and deployed nearly instantaneously, allowing your users to receive new functionality when and where they need it. The What Else: U-Computer is a new technology that allows the Utelogy AV Platform to integrate a PC into an audio/visual system and treat it like any other device, including monitoring and controlling the PC. Soft-conferencing and dialing, application launching, rebooting, and volume control, all with diagnostics and monitoring, are just some of the features that can be integrated into these next-generation AV systems. The Bonus: This release includes other additional enhancements such as U-Manage, for analytics, asset management and disaster recovery, U-Help, an instant video help desk and remote support, U-Command, for operations center control and administration, and a number of additional exciting features.